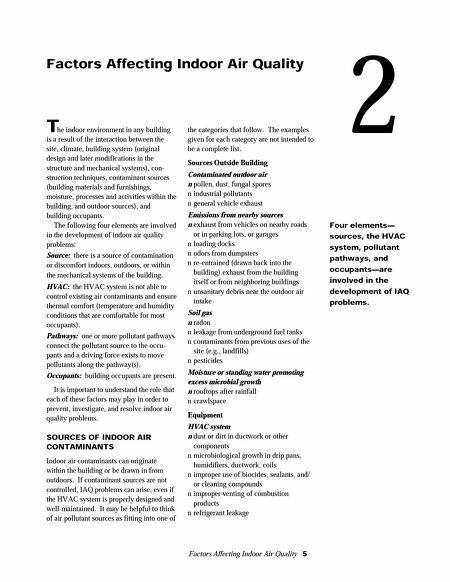 Factors Affecting Indoor Air Quality 5 2 The indoor environment in any building is a result of the interaction between the site, climate, building system (original design and later modifications in the structure and mechanical systems), con- struction techniques, contaminant sources (building materials and furnishings, moisture, processes and activities within the building, and outdoor sources), and building occupants. The following four elements are involved in the development of indoor air quality problems: Source: there is a source of contamination or discomfort indoors, outdoors, or within the mechanical systems of the building. HVAC: the HVAC system is not able to control existing air contaminants and ensure thermal comfort (temperature and humidity conditions that are comfortable for most occupants). Pathways: one or more pollutant pathways connect the pollutant source to the occu- pants and a driving force exists to move pollutants along the pathway(s). Occupants: building occupants are present. 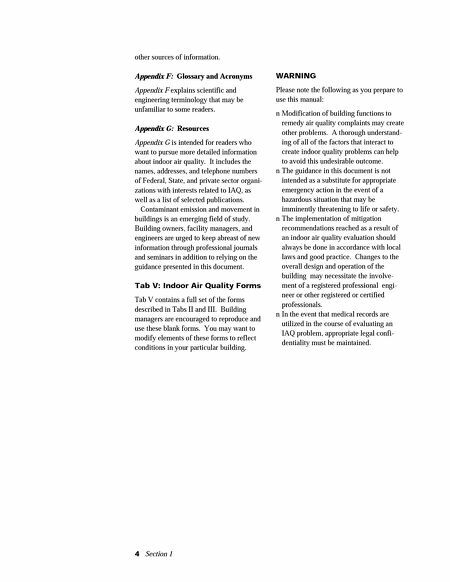 It is important to understand the role that each of these factors may play in order to prevent, investigate, and resolve indoor air quality problems. SOURCES OF INDOOR AIR CONTAMINANTS Indoor air contaminants can originate within the building or be drawn in from outdoors. If contaminant sources are not controlled, IAQ problems can arise, even if the HVAC system is properly designed and well-maintained. It may be helpful to think of air pollutant sources as fitting into one of the categories that follow. The examples given for each category are not intended to be a complete list. Sources Outside Building Contaminated outdoor air ■ pollen, dust, fungal spores ■ industrial pollutants ■ general vehicle exhaust Emissions from nearby sources ■ exhaust from vehicles on nearby roads or in parking lots, or garages ■ loading docks ■ odors from dumpsters ■ re-entrained (drawn back into the building) exhaust from the building itself or from neighboring buildings ■ unsanitary debris near the outdoor air intake Soil gas ■ radon ■ leakage from underground fuel tanks ■ contaminants from previous uses of the site (e.g., landfills) ■ pesticides Moisture or standing water promoting excess microbial growth ■ rooftops after rainfall ■ crawlspace Equipment HVAC system ■ dust or dirt in ductwork or other components ■ microbiological growth in drip pans, humidifiers, ductwork, coils ■ improper use of biocides, sealants, and/ or cleaning compounds ■ improper venting of combustion products ■ refrigerant leakage Factors Affecting Indoor Air Quality Four elements— sources, the HVAC system, pollutant pathways, and occupants—are involved in the development of IAQ problems.